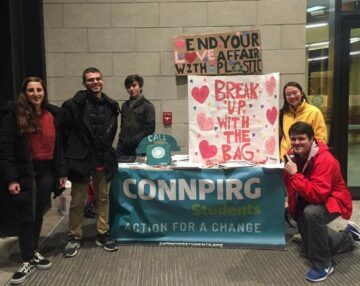 (2019) Convinced Uconn Storrs and the town of Mansfield, CT to ban plastic bags. (2018) helped Register over 2,000 students to vote in the midterm Elections and increased student turnout by 90% at the UConn Storrs student heavy polling location. (2018) Organized CT Go Green rally in Hartford that called on the state to include more renewable energy in their Comprehensive Strategy Plan. (2018) Convinced Dunkin Donuts to phase out their use of foam cups by 2020 in a regional campaign with MASSPIRG Students. (2018) Helped to secure 5 million dollars in federal funding in the FY18 budget for the Open Textbooks Pilot Program by lobbying in DC and organizing phonebanks to representative from CT. We secured funding for the program again for FY19. (2016) Helped register over 2,500 students to vote in the Presidential Election and saw an increase of over 20% at the UConn Storrs polling location over the 2012 Election. (2015) Helped convince McDonald’s and Subway to commit to serving meat raised without antibiotics – a major step towards stopping antibiotic resistance and protecting public health. (2015) Our federal advocate worked with three senators to introduce the College Textbook Affordability Act which would expand the use of open textbooks in order to achieve savings for students. (2010) Helped pass a new law called the Patient Protection and Affordable Care Act to lower health care costs for families including young adults by allowing them to stay on their parents’ coverage until age 26. (2010) Helped to pass the Student Aid and Fiscal Responsibility Act, which among other things, adds $36 billion into the Pell grant program. 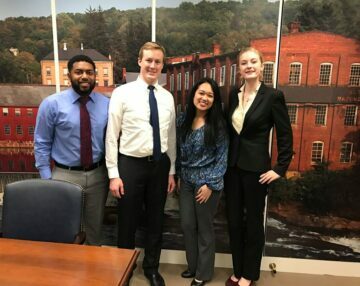 ConnPIRG Student Chapters and Student PIRG lobbying and organizing over the past several years was critical to the passage of this historic law. (2010) Students in Connecticut joined together with thousands of students on campuses across the country through our annual Hunger Cleanup each April to raise money and volunteer in a day of service in their communities. 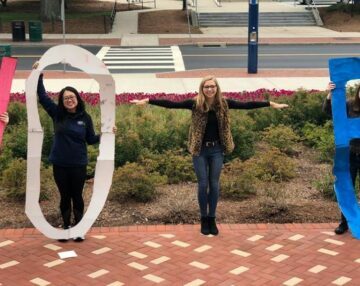 This year, in addition to service events and food drives, ConnPIRG students raised over $20,000 to help local shelters and service agencies keep operating as well as donated funds to relief projects in Haiti. (2009) Helped pass strong legislation called, the Credit Card Accountability, Responsibility and Disclosure (CARD) Act that will end some of the worst abuses of the credit card industry, including some which are often targeted at college students. (2009) Student PIRG and ConnPIRG student activists mobilized their peers and helped persuade Congress to include an additional $2.5 billion down-payment for high-speed rail in their appropriations bill, more than doubling President Obama’s original recommendation. (2009) Help to launch the Resolve Conference, where 250 students from across the country were joined by activists, advocates and organizers for a weekend of education and training to create anti-poverty campaigns in their communities. (2008) Helped with passing the Higher Education Opportunity Act. The law contains several important policy changes, including an increase in the maximum authorized level of the Pell Grant to $9,000. (2007) Joined the nationwide Student PIRGs’ What’s Your Plan? Campaign which talked to the presidential candidates over 100 times on the campaign trail, to ask them about their plans for global warming and higher education. (2007) Helped pass the College Cost Reduction and Access Act, the largest increase in federal student aid in 20 years. The law also made dramatic cuts in interest rates for student loans. Read more about our recent accomplishments here.